A few days ago, Microsoft launched a website named how-old.net. The site was designed to test out the company’s new Face Detection API, which uses machine learning to guess peoples’ age and gender based on their picture. Hoping that 50 people or so would give the site a try, Microsoft handed the website address out to a couple hundred people, asking for feedback. Anyone who’s been following social media can probably tell you what happened next: How-old.net has since gone viral, spreading from that initial group of a couple hundred to tens of thousands in 3 hours. And it’s only gotten bigger since – it seems the Internet loves having computers guess how old they are. My Twitter timeline has been flooded over the last few days with friends sharing pictures of themselves and their machine-calculated age using the hashtag #HowOldRobot. My Facebook friends were just as eager to share. As it turns out, the site is pretty easy to use. Just navigate to how-old.net on your smartphone or PC and click the upload button prominently displayed on the site. You can also try the technology out on some pre-loaded pictures if you’d rather not share a photo of yourself. The good thing is that Microsoft doesn’t save and store our uploaded pictures – your photo is solely used for the purpose of guessing your age. Yes, the site isn’t 100% accurate all the time. But as the Internet has discovered, facial recognition tech can be fun to play around with. So just for fun, give the site a try. And do let us know – was it as accurate for you as it was for me? 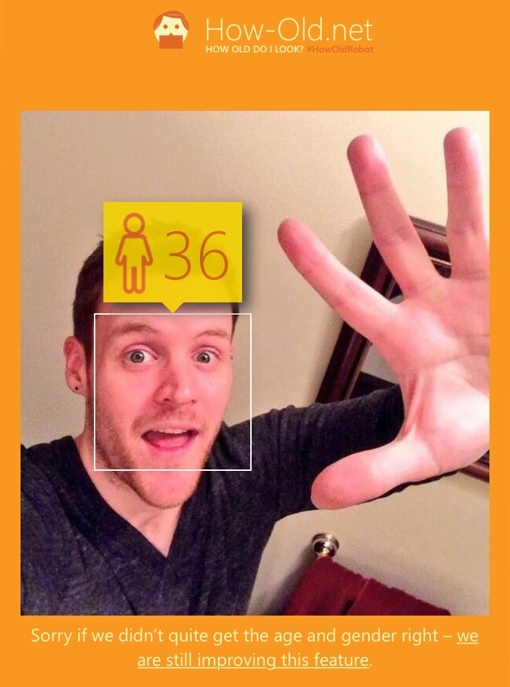 The HowOldRobot got my gender right, and said I look 30. I’m 60, so that felt good! Just the opposite—I’m 60, and the site told me I was 71! And most people consistently tell me I look in my mid-50’s so it saw saw grey in my beard, and added more years! I’m 68 and I submitted 3 pix from the last 2 years - it said I was anywhere from 36 to 44! Everyone tells me I look younger than my true age, but wow! I am 63 and most people say I do not look that old. The site said 87. It set me 4 years younger, my husband 1 year older, and our two sons went from 21 and 23 to 33 and 37! And we are always told how much younger we (all) look than our ages, so it really got our sons wrong. And I submitted my friend’s pic, and everyone always thinks she is my older sister or mother (yes, it has happened! ), even tho she is a tad younger than I am, and it said she was 7 ears younger than she actually is. So, no, I don’t think it works all that well. I’m 56 and the app guessed 39. Nice! FYI - I’m a 49yr woman. I must say I was shocked how awful I felt after this little “test”. How could some dumb test manipulate my self image?